Latest happenings at Small Bites by Jessica, this week’s Link Love, and Menu Plan Monday! Happy Monday everyone! Hope you had a wonderful weekend. We were busy around here – took the girls to see a show at our local theater, did some meal prep for this week, went to a kid’s birthday party, and had the girls help me make my Cranberry Orange Bread to bring to a friend’s house for brunch on Sunday, which was a lot of fun. Over here at Nutritioulicious I’ve been busy recipe testing some new recipes that will be coming your way soon and I finally got on board with everyone else and did my first Facebook Live last week! Did you see it? It’s all about meal planning! You can check it out here. I’m hoping to start doing these on a more regular basis, so stay tuned for that and be sure to follow me on Facebook if you don’t do so already! 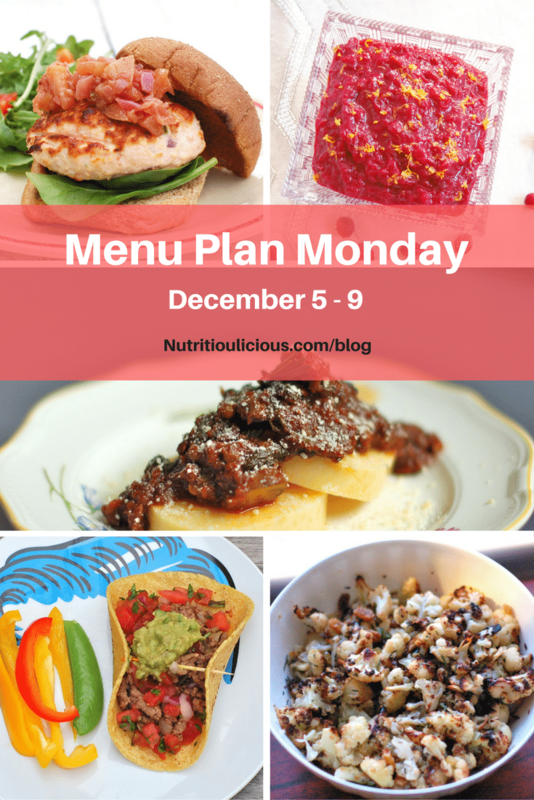 Now let’s take a look at the reads and recipes of interest from last week and this week’s menu plan. ⇒ What’s a holiday party without a cheese plate?! Emily has a great guide to making one! ⇒ The health of your digestive tract – gut health – is so important and research is showing more and more just how important it is. Sonali shares some easy tips for keeping your gut healthy. ⇒ Granted I’m not the biggest potato lover (unless crispy or well done), but that’s just a personal taste preference. There’s no reason to avoid potatoes if they are your thing. Kaila does a great job explaining why. ⇒ Turmeric is responsible for that pretty yellow color and warm and peppery flavor common in curries, but did you know it’s also really good for you? Find out why and then try it in your cooking – you can make my Summer Shakshuka! ⇒ You know I love my peanut sauce (I use it here and here)! Can’t wait to use it on this easy weeknight dinner! ⇒ These little tartlets are so adorable and look delicious. Such a yummy, nutritious way to end a meal. Perfect for holiday parties too! ⇒ Who wouldn’t love healthy meals that are also budget friendly? Annemarie has 60 of them here! ⇒ A pretty, simple, and aromatic cocktail for the holidays. What were some of your favorite reads and recipes from last week? You’re most welcome Sonali! Can’t wait to try those recipes!